PEARL, MS - Mississippi Braves manager Chris Maloney was awarded the Bobby Cox Manager of the Year by the Atlanta Braves during the Eddie Glennon Gameboree, Atlanta 400 Baseball Fan Club's 53rd annual winter banquet and fundraiser on Saturday in Atlanta. 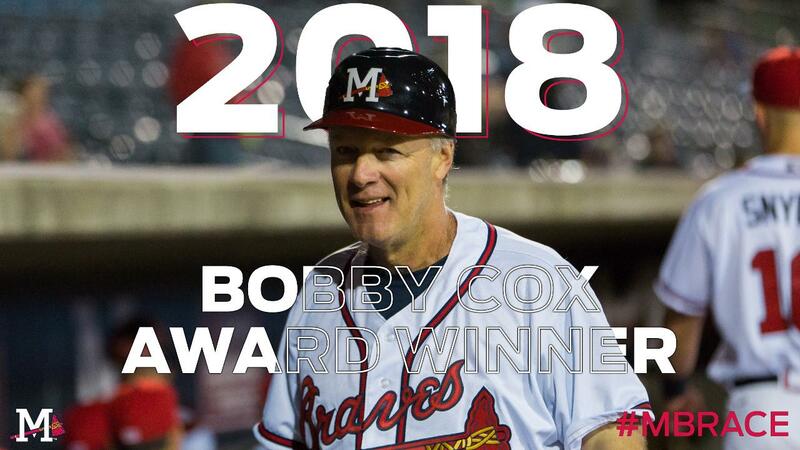 The Bobby Cox award is presented to the individual that best represents the top managerial performance through Atlanta's minor league system. Previous M-Braves managers to earn the honor were Aaron Holbert (2013), Phillip Wellman (2008) and current Atlanta Braves manager Brian Snitker (2005). "I want to thank the Braves and the Atlanta 400 Club for presenting me with this award," said Maloney. "You never win an award like this unless you have a great team behind you. I'd like to thank my family, my wife, my coaches who did a tremendous job, Dennis Lewallyn, Carlos Mendez, and Paul Howey. I'd also like to thank the ball club we had last year for playing as hard as they did. To win an award named after Bobby Cox is a super honor because there was none better than Bobby Cox." 2018 was Maloney's debut with the Atlanta Braves organization. The Jackson native guided the M-Braves to a 67-71 record, boasting a 38-30 mark in the second half of the season, missing out on the playoffs by just one game. "Hammer" kept Mississippi in contention despite numerous roster changes and injuries. At the end of 2018, Maloney ranked ninth among active minor league managers with 1,417 wins (1,417-1,321 overall record, .517 winning percentage). Maloney, 57, the seventh skipper in franchise history attended Jackson's St. Joseph High School and went on to play collegiate baseball at Mississippi State University, graduating in 1983. The Atlanta 400 Baseball Fan Club (formerly Braves 400 Fan Club) is a non-profit organization of baseball fans dedicated to supporting the game of baseball at all levels. For more information, visit www.atl400.org. Maloney will be participating in the Hot Stove Hall of Fame Evening at the Mississippi Sports Hall of Fame and Museum on Thursday night. For more information visit www.msfame.com. 2019 season tickets and mini plans are on sale now, as well as group and corporate opportunities! For more information, call the M-Braves Front Office at 601.932.8788 or 888-BRAVES4.